St Mary’s Church is one of the prominent land marks after the Abbey in Whitby. It sits high above the east side of Whitby, looking over the harbour and with the 199 steps leading up to its graveyard which inspired Bram Stoker’s writing. It was founded around 1110 and has been modified by each century ever since. 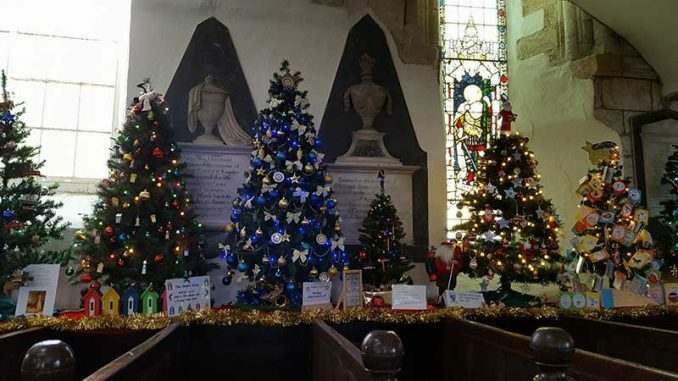 St Mary’s Church at Christmas, displays over 90 personally decorated trees by local businesses, schools and also by family members for loved ones that are no longer with them. I love going up to see these trees as the atmosphere and the ambience of this beautiful church is a magical site. This church at Christmas brings back lots of my childhood memories, as my primary school East Whitby would hold their carol service here and still does. The whole school would go on a bus to get there, which was exciting enough in self; once you were there you would look out for which ever relative would be looking down at you from the balcony. Once you had located your family member, you would lock eye contact with them for the whole carol service and then from deep within your soul, you would sing every song with such emotion to your family member! This would-be songs such as the Little Donkey, you would feel each step that little donkey had taken on that dusty road and the turning the song into the ultimate power ballad, you would sing –“Little donkey carry Mary Safely on her way” with such passion! My children are growing up and letters to Father Christmas have been replaced with Whatsapp messages with Amazon links to what present they would like. The magic is slowing going but going to see these Christmas trees really makes you feel that Christmas is about spending time with loved ones. So, knowing that my teenager would not want to come, I had paid her off with money that she has “earnt” this week from doing things that not in her normal remit like you know, putting her shoes away, putting her pots in the sink and making her bed!! I still had my 11 year old to see to, so various deals were negotiated so that he would accompany me on this trip as he was being dragged away from his virtual Sims family to socialise with his real family! First deal to be completed for my son’s company- a visit to my son’s favourite café on Church Street, The Blitz. This café is has a second world war theme, the menu is based around dishes from this era. The whole café is decorated in a vintage theme and even the passage way to the toilet has sandbags on the wall. The food is great; no rations portions in sight and this place also has a tapas menu on a night. After filling our faces, it was off to tackle the 199 steps and up to the Church. Second deal was, a trip to the Hunter’s Sweet Shop on Church Street for strawberry bon bon sweets and a gob stopper lolly pop. This shop is a traditional sweet shop, so the sweets are measured out for what every quantity you would like. So, with my son with his pockets filled up with sweets, we went on our freezing cold exploration up the 199 steps with views of the North Sea crashing into the harbour mouth. St Mary’s Christmas Tree Exhibition did not disappoint, the detail and time people had put into them were specular and touching. Trees that are decorated to remember loved ones at Christmas are a wonderful way of remembering people that won’t be with us at Christmas time. Once the bad memories fade from losing loved ones, remembering them at Christmas can bring back a flood of happy past memories. It can bring a smile to your face, thinking about them at Christmas and past traditions. It is 10 years since my Dad past but thinking about him on Christmas morning makes me laugh because it was the only time he cooked – he made the bacon sandwiches!! The Whitby Fisherman’s Amateur Rowing Club had been planning their tree since summer, and local people had been writing their loved one’s name of wooden oars to be hung on this tree. Local charities and causes have all donated trees and decorated them with their own unique style. Local businesses trees were fantastic, a local café Marie Antoinette made a tree out of tea cups! Viewing these trees were special enough but with the backdrop of this exceptional church with all its history, made the experience more memorable. It was so cold you could see your breath! To warm us up, off me and my son went to Mademoiselles, a café bistro on Skinner Street for a hot chocolate with the works in their gin den.